It’s rare for DesserBuzz to have so much access to so many great pastry chefs in the middle of a dessert service. In a restaurant there would be many reasons why they wouldn’t want me in there snapping pictures, asking silly questions and sticking video cameras in their faces. Last night however, while they were prepping the desserts, there was plenty of space and relative peace and quiet. Plus, the chefs still had plenty of energy left to chat about their creations. The first honoree I spoke with, Chef Nicholas Lodge of the French Pastry School in Chicago, had one of the most colorful and beautiful looking desserts of evening. He called it “chapeau chic” but later described it to me as a fantasy of a cherry blossom. 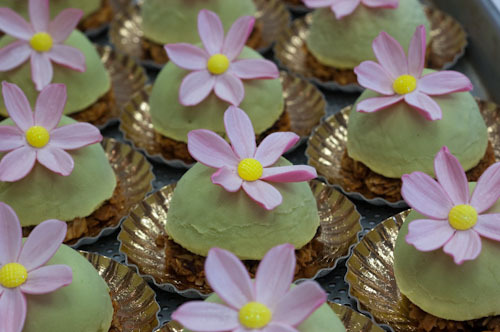 One of Nicholas’s specialties is gum paste flowers, fondants and wedding cake design. He told me it take about 2-3 minutes to make each gum paste flower. Now consider that he had to make 300 of them and you are looking at 600-900 minutes and we haven’t even gotten to the main part of the dessert yet! Here’s some video of Nicholas in action with his creation.